This SIMION user program implements a rather complete hard-sphere collision model. Collision models are useful for simulating non-vacuum conditions, in which case ions collide against a background gas and are deflected randomly. Ion collisions follow the hard-sphere collision model. Energy transfers occur solely via these collisions. Background gas is assumed neutral in charge. Background gas velocity follows the Maxwell-Boltzmann distribution. Background gas mean velocity may be non-zero. Kinetically cooling and heating collisions are simulated. Background gas as a whole is unaffected by ion collisions. SIMION 8 includes a Lua version (collision_hs1 example). It is somewhat more updated and documented than the SL version above. Note: REV-4 made this correction: Issue-I362 - HS1 collision model does not accurately thermalize. 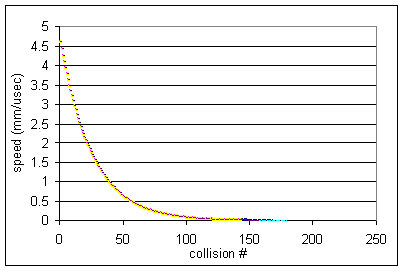 The figure below shows ion trajectories in the HS1 collision model (dots mark collision events). Conditions: ions of mass 200 amu, 15 angstrom collision diameter, and initial velocity to the right at 24 eV colliding against a He background gas with 2 angstrom collision diameter, 4 mTorr pressure, and 275 K temperature. Collisions tend to kinetically cool ions initially. As ions slow down, mean-free-path decreases and the scattering effect increases. 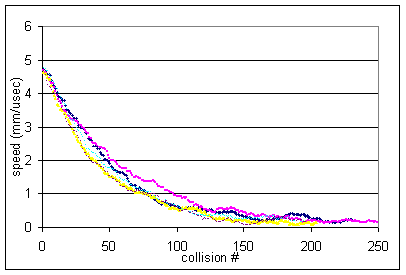 The below figures area plots of ion speed per collision number using the HS1 collision model as well as the dahl_drag.prg and _Trap/INJECT.PRG in SIMION 7.0 models for comparison. The Ling1997 paper (Figure 4) provides a similar graph for its collision model under the same conditions. The HS1 and dahl_drag.prg models are in fairly good agreement in this aspect. However, these differ from the Ling1997 and _Trap/INJECT.PRG graphs, which are similar to each other and show almost twice as rapid dampening. (Note: full details of Ling1997 are not available.) The reduced dampening in the former models seems partly due to the inclusion of heating collisions from behind the ions. Despite these similarities in the above regard, the models can still be quite different. For example, HS1 model supports a variable mean-free-path (unlike dahl_drag.prg), and this affects the frequency of collisions, especially as speeds change. Models can also handle angular scattering differently (e.g. _Trap/INJECT.PRG does not provide any angular scattering). This program calculates mean relative speed between the ion and background gas in order to calculate mean-free-path. 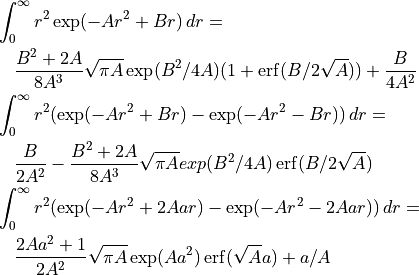 The following is a derivation of the equation for mean relative velocity. 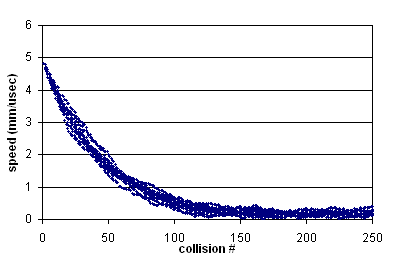 Compute average relative speed c of a single particle (ion) against a background gas (gas). The background gas is assumed to be Maxwell distributed in velocity. 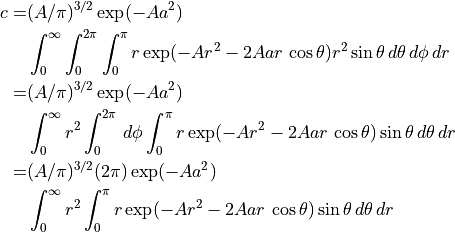 Convert to spherical coordinates and let . This result is in agreement with Ding2002. Further, if , then , which is approximately the average relative speed between the gas particles themselves ( ). The above results provide a rough justification for the approximation .